Homeowners are always asking questions like “How long should I water?” or “How many inches should I water?". There is no pat answer for this question, of course, due to all the variables that can affect your water needs throughout the season. However, if you want a ball park figure for watering, turf pros generally agree that the amount of water a lawn requires (whether through rain or through your sprinkler) is ¾ - 1 inch per week. This amount is for lawns that are actively growing and not dormant or in a slow growth stage. Set out a four or more wide mouth containers (such as pots or tuna cans) on the grass, spaced evenly within the spray pattern of your sprinkler. 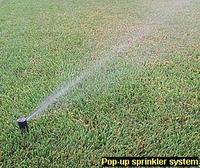 Then turn your sprinklers on and run for twenty minutes (or 1/3 of an hour). Then measure the amount of water in each can with a ruler. Figure out the average amount of water per can after taking all the measurements. Then multiply by 3. This will tell you, once and for all, how many inches of water you get per hour of sprinkling -assuming your water pressure doesn't change. By placing the containers in various spots, you'll also be able to note whether the spray pattern of the sprinkler is distributing the water evenly and whether you may need to make some adjustments or do some overlapping when you move the sprinklers around. IF you want to water like a pro, you need to actually take a look at the soil in the root zone (3-5 inches deep for most home lawns) of the grass occasionally to see if it is moist, dry or over-saturated. After watering, wait 30 minutes (an hour for heavier clays) and then check to see how far the water has penetrated. Step on a spade and push it back and you can see where the dry soil begins and ends. Get to know your yard, your soil type and where the dry and wet areas are. Amount of actual rainfall. Most people are fooled by rains and think they are getting more water than they really do get. A rain gage is a good, cheap tool to have. Temperatures. This is obvious. Higher temperatures mean faster drying conditions. It may also speed up grass growth for a while, and that will also increase water absorption by the grass. Wind. If you are in a windy location there is going to be a lot of water loss due to evaporation. Tree root competition. Trees can take an enormous quantity of water out of the ground and their roots will go right into the lawn area if that is the only place where it can find water easily. Lawns on the south side of trees dry out extremely fast. You need to compensate for the tree's water needs when you water your lawn. Soil Compaction. Clay soils are compacted by definition (see below), but even good loams and sandy soils can get compacted. Water has a hard time getting to the root zone when the soil is severely compacted. For years, our customers have been improve soil compaction and water penetration by using our Aerify PLUS soil conditioner. Applying before a heavy watering is the most effective way to use it. Water sits on top of a compacted Clay soil. See why, below. Clay soils are made up of microscopic size rock particles that bond together somewhat magnetically. There is little to no airspace between these particles, and water penetrates through very slowly, completely saturating the soil with very little “free water” left for plants. They tend to swell up when wet and shrink back when dry, often forming cracks in the soil and squeezing or tearing roots. Denser clay soils can be very hygroscopic - meaning water binds to it so tightly that roots cannot absorb it. This is why clay soils usually need more water than you would imagine to keep plants from wilting. If your clay soil feels wet, but your grass or garden plants are wilting, you probably have a hygroscopic clay soil that is going to need more water until the soil is improved. Sandy soils, on the other hand, have larger, visible rock particles in them – perhaps 1000 to 2000 times larger than clay particles. Unless extremely compacted, there is a lot of airspace between sand particles. Water infiltrates sand quickly and deeply and there is more “free water” available for grass and plant roots to grab. If you want an analogy in terms of size and free airspace, think of sandy soil as a barrel of basketballs and clay soil as a barrel of marbles. On a medium textured sandy soil, an inch of water can penetrate down to 12 inches, in just 2-3 hours. On a medium-clay soil, an inch of water may only penetrate about 4 inches deep, and it would take 6 hours or longer to get that deep. Puddling or runoff is a real problem on clay soils. In terms of drying out, as you may suspect, sandy soils dry out much faster than clay soils. Silt is a very small soil particle between sand and clay size. It has more of a sand physical appearance, but tends to compact and tighten up more like clays when it makes up most of a soil. Loam soils are a nice mix of sand, clay, silt and organic matter. If not badly compacted they will absorb, hold onto and release water in a more ideal fashion. Depending on amounts of each particle, you can have clay loams, sandy loams or silt loams. Soil types will be discussed more thoroughly in a later section. We said earlier, the suggested amount of weekly water for lawns is about ¾ - 1 inch of water. Since an inch of water on a sandy soil goes perhaps 12 inches deep (and your grass roots are only perhaps 3-6 inches deep), it would be better to water a sandy soil lawn 2 to 3 times a week, putting down ½ -1/3 of an inch respectively. If you have a nice loamy soil, or clay loam, you can put down an inch at a time, once a week. If the grass is not responding you may have hydroscopic conditions that require more attention. If you ever find that your water is puddling or running off, break up the watering into a few stages on the same day. Give the water a chance to penetrate and create some channels in the soil before resuming watering. Again, spraying the lawn with Aerify PLUS will help with penetration, and hydroscopic conditions. but you could also get some improvement just by applying a few oz of dish soap per 1000 sf ahead of watering.